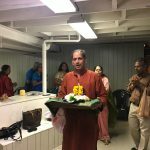 By divine grace, the Seattle satsang devotees had an extremely blissful Guru Poornima satsang on the 25th of July from 5:30pm to 7:00pm at the residence of Sri Dhilipji & Smt. Shanthiji. 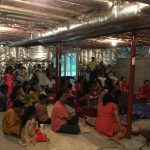 The satsang was attended by around 50 adults & children. 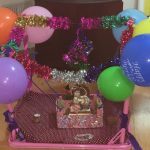 The celebrations started off with the chanting of the Mahamantra for 15 minutes followed by the recitation of Thottakashtakam and Guruashtakam. The balagurukulam session, which immediately succeeded this, had each child dress up as a Guru (Sri Adi Shankara, Sri Ramanujacharya, Sri Ramakrishna Paramahamsa, Meerabai, Sri Shirdi Sai Baba, Sri Ramana Maharshi to name a few) and present themselves to the audience through facts about the Guru they represented. Based on this, the audience were required to guess which Guru each child represented. The beautifully dressed up children and the enthusiastic answers from the audience really lighted things up! 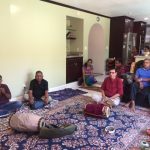 For the Atma Anubhavas section, we had the fortune of listening to a portion of Sri Bhagyaji’s Madhurasmaranam discourse (the remainder will be played in the following satsangs).